Although his name has been chiefly associated with the gold rush era of the Cariboo, Alexander C. Anderson was active as a trailblazer in New Caledonia long before gold was discovered. He later became Victoria's first postmaster and the province's first historian, publishing a viable history of the region in 1883. 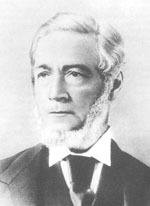 Alexander C. Anderson was born in Calcutta, India, in 1814. As the grandson of the Scottish botanist Dr. James Anderson, he was educated in England prior to working for the Hudson's Bay Company in Canada from 1831 to 1854. He arrived on the Western Slope in 1832 by crossing overland through the Yellowhead Pass and venturing down the Columbia River. Early in his career he assisted in the establishment of Fort McLoughlin and the relocation of Fort Simpson. According to historian Netta Sterne, when the Hudson Bay Company had to abandon its Columbia Basin trails in accordance with the 1846 Oregon Treaty, it was Anderson who led three tough expeditions north of the 49th parallel to establish alternate transportation routes for the HBC. As early as 1846 Anderson found a route through the Harrison, Seton and Anderson Lake areas. More significantly, he was the pathfinder who identified the most favourable route between the Cariboo and the coast. He did so with the assistance of an Aboriginal named Blackeye who guided Anderson's party north to Kamloops. It later became known as the Douglas Trail after James Douglas commissioned Anderson to define the route. Having explored much of New Caledonia, Anderson published one of the best and most popular guidebooks of his era, Handbook and Map to the Gold Region of Frazer's and Thompson's Rivers (San Francisco, J.J. LeCount, 1858), including some Chinook jargon and a folding map. He was listed on the title page as Late Chief Trader Hudson Bay Co's Service. This work is a rarity priced in the $6,000 range. Also an amateur ethnologist, Anderson provided George Gibbs with his Notes on the Indian Tribes of British North America and the Northwest Coast in 1863. Anderson became the first Collector of Customs in Victoria in 1858 and he later worked as an Inspector of Fisheries. He continued his explorations and writing until his death at age 70, after an expedition to find an appropriate site for a salmon hatchery on the Fraser River. Anderson, Alexander Caulfield. Notes on North-Western America (Montreal: Mitchell & Wilson Printers, 1876). Anderson, Alexander Caulfield. A Brief Account of the Province of British Columbia (Victoria: R.T. Williams, 1883). [Alan Twigg / BCBW 2005] "History of B.C." "Chinook" "Early B.C." "1850-1900"